How To Make Your Android Battery Last Longer: In the modern world, everyone uses their smartphones in a whole day. Nowadays, the processing power of smartphones is increasing. That’s why smartphones consume a lot of battery. Also, many smartphone companies provide huge capacity batteries in their smartphones. But, at the end of the day, you need to recharge your phone’s battery. So, there are some battery saving tips and tricks available to increase the battery life of the Android phone. People also do searches for how to make your Android battery last longer and how to increase battery life of Android phones. So, here at oTechWorld, we are writing the best tips to increase the battery life of your Android phone. So, there are many tips available to extend the battery life of a smartphone. If you want to extend Android battery life (Increase recharge cycle of the battery), then you need to charge your phone’s battery from 30% to 80%. If you recharge the battery from 30% to 80%, then it helps to increase the recharge cycle of the battery. This is the first tip to extend Android battery life. If you are not using these functions, then you need to turn off Bluetooth, WiFi and Location services. If you always turn on these services, then these services consume a lot of battery. You can turn on manually Bluetooth, WiFi and Location (GPS) services when you need. Also, you can turn on Data connection when you need. If you turn on Data connection always, then it also consumes a lot of battery. So, always turn on these services manually. Because you don’t need to connect always or every time. If your GPS location is turned on then many apps trying to track your location after some time interval. This process also consumes more battery. In Android, there is an option of Auto brightness. But you need to adjust the brightness level manually according to your needs. Because Auto brightness cannot perform well and in an indoor location, it sets high brightness. So, you can save a lot of battery by adjusting brightness manually. In the night you need a very low brightness. So, you can adjust it manually to extend battery of the Android phone. You need to turn off auto update apps. Because, when apps updates are available then Android starts updating the apps. While updating your data connection is on and Android phone consumes a lot of battery. Also, if your data connection is low and apps sizes are huge then it takes a lot of time to update these apps. So, you need to turn off auto updates from Google Play Store. You can update these apps manually while charging your phone and connect your phone to WiFi. To turn off auto-updates, Open Google play store and Go to Settings > Auto-update apps and choose Do not auto-update apps. There are many unwanted sounds and vibrations enabled in the Android phone by default. Touch vibration, Dialer pad tone, Notification vibration and lock screen sound also consumed the battery of your smartphone. So, you also need to turn off these unwanted sounds and vibrations. If you turn on vibrate touch, then, every time you touch on screen it vibrates. Vibrate motor consumes a lot of battery. You also need to turn off keyboard vibration. Because when you are chatting your Android smartphone, then every time you touch on the keyboard it vibrates. To Turn off unwanted sounds Go to Settings > Sound & Notification > Other sound and turn off unwanted sounds. To Turn Off keyboard touch Vibration and Sound, Go to Settings > Language and Input > Tap om Gboard > Preferences and “turn off Sound on keypress” and “Vibrate on keypress”. You need to set shorter screen timeout to extend the battery of your Android smartphone. You can use 30 seconds screen timeout. Because sometimes we left our phone without locking. So, it helps to save the battery of your smartphone. So, you need to set screen timeout less than 1 minute to save the battery. Live wallpapers are looking so pretty. But, Live wallpapers also consuming more battery. So, you can always use a static wallpaper on your smartphone. Also, if your smartphone has an AMOLED screen, then you can use black wallpaper to save the battery of your smartphone. There are many applications, that are consuming your data in the background. So, you can also turn off background data on your Android phone. Here’s How To Disable Background Data In Android Phone. You can turn off data connection when you don’t need. In Android, there is an option to disable background data for particular apps. So, you can use this feature to turn off data for those apps that are consuming more data in the background. Battery saving mode feature is the best option in Android Lollipop and above. You can use this feature to save your smartphone battery. But, it reduces the performance of your smartphone. Also, it disables the background services and animation effects. The leading smartphone companies provided their own battery saving mode in their smartphones. In SAMSUNG smartphones, you can use Ultra Power Saving Mode and Sony has also provided STAMINA mode. In HTC smartphones, you can use Extreme Power Saving Mode to increase the battery life of your Android smartphone. To Turn on Battery Saving mode, Go to Settings > Battery > Tap on options. If your Android phone has AMOLED screen, then there are two tips for you to increase the battery life of your phone. On AMOLED screen, black pixels are off. So, with these tips, you can extend Android battery life. Use Black Wallpaper: You can use black wallpaper on your Android phone to increase battery life. Because On AMOLED screen black pixels are off pixels. If you are using black wallpaper then black pixels are also in off mode. So, these black pixels are not consuming the battery power. Use Dark Keyboard: you can also use the dark keyboard theme to increase battery life. If you are using a black theme, then it helps to save the battery of your phone. Here are Best Google Keyboard Tips and Tricks. Don’t install apps if you don’t need. Because many apps are running in the background and consume battery of your phone. So, you need to uninstall those apps that are useless for you. You need to find those apps that are consuming more battery. So, Android has this feature. You can find battery consuming apps from settings. If you find any app consume more battery, then uninstall it. With battery charging tips, you can keep your phone’s battery healthy. Also, it helps to increase the battery life of your Android phone. Here are 5 Battery Charging Tips For Android Phones. Charge your Phone’s battery from 30% to 80%. Don’t use your phone while charging. Keep your phone’s battery cool. So, these are tips for How To Make Your Android Battery Last Longer. With these tips, you can extend Android battery life. Also, with battery charging tips, you can increase battery life or recharge cycle of the battery. 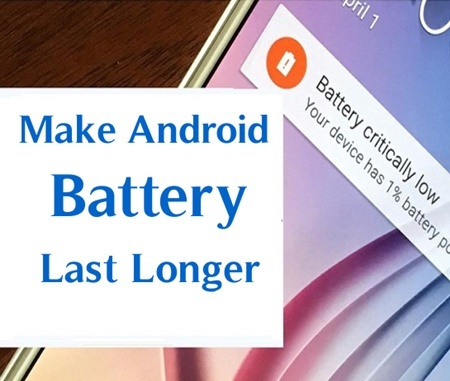 If you are searching for “How To Make Your Android Battery Last Longer” then these tips are best for you.